What Works for Me: Popcorn! It’s no secret to those who know me well that I don’t really enjoy cooking. I can cook, but I’m not too fond of it. That doesn’t mean, though, that I don’t enjoy a good cooking discovery. So, today I’m going to share one of those with you! I love popcorn. Always have. My favorite is just plain old salted popcorn, although a little butter or white cheddar flavoring doesn’t hurt. The problem, though, has always been that it’s hard to get the great salted flavor. Salt just doesn’t stick well to cooked popcorn. I want it infused. What to do, what to do? So, today I’ll share with you what we do. If you don’t like popcorn, just move along. If you only like air popped popcorn without the oil, also move along. If you already make awesome popcorn and don’t need a new suggestion, that’s fine, too. If, however, you do like popcorn but always do the microwave version because you can’t make stovetop work out, are afraid to pop on your electric stove, or just haven’t been satisfied with your results, stick around. Several years ago, we watched culinary hero Alton Brown discuss popcorn on an episode of Good Eats. He recommended popping popcorn in a stainless steel mixing bowl rather than in a straight-sided pot. Well, all of our mixing bowls had rubber bottoms that rendered them useless on the stove top, but it got us thinking about what we could use instead. The solution? Our flat-bottomed wok! What makes this work? 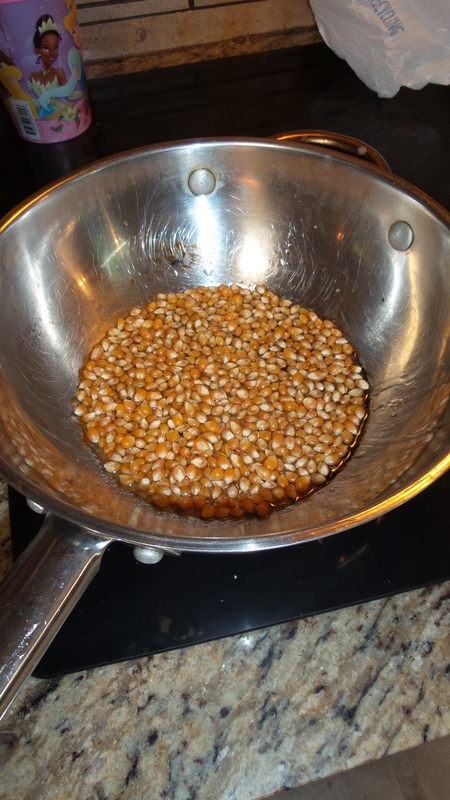 Well, the flat bottom gives a great surface for the unpopped corn to rest in the hot oil, but the slanted sides allow room for the popped corn to move out of the way. More effective popping, less burning, and fewer unpopped kernals. Voila! But, that was just the beginning of our experimentation. Next came the actually popping experience. Alton Brown topped his stainless steel bowl with aluminum foil and poked holes in it. So, that’s what we started with on the wok. But, we frequently had issues with hot oil popping up out of the holes. So, we’d put a lid over it, but that allowed moisture to collect. Doug came up with a perfect alternative! He took a splatter screen we didn’t use very often because of its size. He then covered it on both sides with aluminum foil. Because of the way it fits over the wok, this allows air flow and coverage all at the same time. And the handle matches well with the wok handle to make management easy. Oh! And when you’re done, you can just wrap it in a sack for storage rather than replacing the foil every time. Next comes the actual popping process. Cover the bottom of the wok (or bowl) with oil. You want enough oil to “lubricate” all of your popping corn. Salt the oil. Yes, salt first! Cover the oil with a layer of extra fine salt. Courser table salt will work, but not as well. Finally, add the corn, a single layer. If needed, add a little more oil to the top to ensure there is enough to hit every kernal. Cover and pop over medium high heat. I usually just let the wok sit on the heat until the corn starts to pop. Then I shake it a bit, put it back on the burner, and wait for it to begin popping more convincingly. I alternate between lifting/shaking and letting it rest on the heat. I do use a flat top electric stove, so you’ll obviously have to make adjustments based on your stovetop surface. As with all popcorn, when the popping has slowed to a few pops every few seconds, remove from heat and wait until all popping has ceased. Then remove the screen and transfer to a bowl for any additional seasoning (we like Kernal’s seasoning, if we add anything). Note: If you take a bite immediately after removing the splatter screen, you’ll notice that the popcorn seems tough and chewy. Give it a minute to “rest,” and this will work its way out, leaving perfectly textured popcorn. Next Post Marriage Monday: Play Time!